TCR200RFID guard tour rackage including 10 pcs 125 kHz ASK RFID guard tour checkpoints. RFID Guard Tour Checking System TCR200RFID is designed for the harshest environments. The metal body and molded rubber shell, which protect the electronics against damage and secure the collected data, are the key points to TCR200RFID's extreme durability. With special waterproof pad and adhesive, the reader is so waterproof that it even can work under water. Furthermore, over 60000 reads are able to be stored before the next download of data. Then the guards go to the checkpoints, the Reader will automatically read each RFID tag and no need touch it. When reading successfully, a flash of the red indicator light accompanied by a “beep” means that a reading has been made. The TCR200RFID reader will store the signal card’s ID number and time for every station reading. 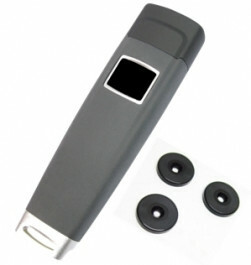 After patrolling are done, use the USB port cable to connect the computer and the Reader directly and have a data analysis and management.